Take 10% off all orders $100 and over for a limited time use code 10over100 on checkout. Have a smaller project? You still get 5% off using code 5offsummer on checkout. Whoopie! Finally a professional tool that is proven to lessen the time and make easy work of placing crystals whenever hand gluing Swarovski Elements, Flatbacks, for size 12ss thru 40ss crystals. Can also be used for other craft projects. 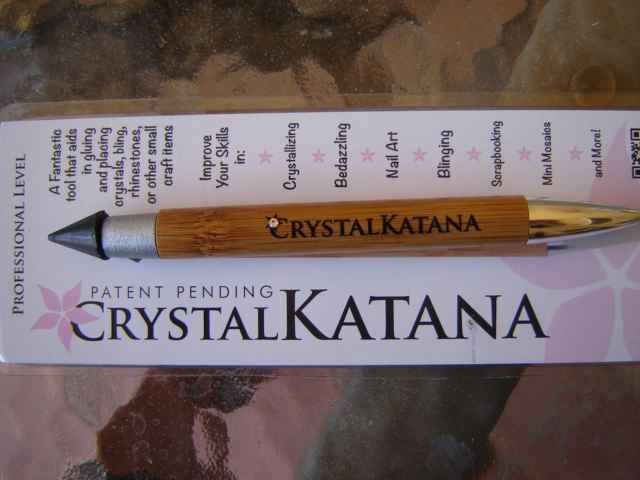 The Katana, looks like a sturdy pen, but it's a clever two-sided tool that is a time saver when rhinestoning The Katana, innovative, patent pending, helps to accurately and easily glue by lifting and placing crystals with it's black wax refined tip. Then it also helps you obtain a secure bond by just flipping to other end of pen which is used to press down crystal and slide in place if necessary. So easy to maneuver, makes crystalizing with glue easier than ever. Amazing that it looks like a two sided pen with a black tip that is actually a wax tip on one end and then a silvertone tip on other end used to firmly press crystal onto glue for a definite secure bond. It is so easy to handle and fits comfortably in palm like a favorite pen. Remarkable invention for any gluing crystal project. It doesn't get easier than this. Your work time will be reduced while producing a clean finished project. Purchase a Katana at Rhinestonedepot.com at a true discount.